our perfectly imperfect life: Where did my baby go? I seriously can't believe Mason is five years old already. It seems like just yesterday I found out I was pregnant with him after trying for so many years. And he is five already?! 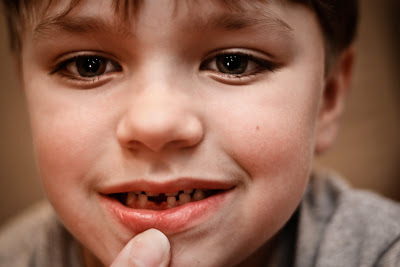 It all sort of hit me today when Mason lost his first tooth. Since when do I have a kid that is old enough to lose a tooth?! It has been loose for awhile, but the final straw was when Chicky knocked it loose enough to pull today ... err, that is his story, at least. He cried because he was nervous for me to pull it ... and I think it freaked him out that he was about to lose a part of him. And I cried after I pulled it because he is such a big boy, he makes me so proud ... and I can't believe he is so old! What a milestone. How much do teeth goe for these days? Awww, he's such a big boy! 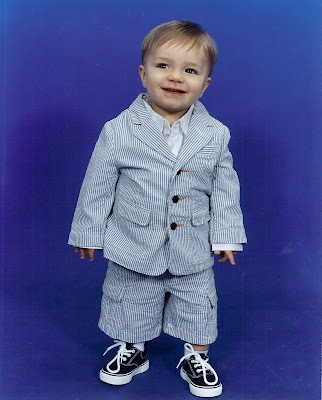 That little seersucker suit with the deck shoes is just about the cutest thing I've ever seen. I am so not ready for big boy milestones like that. Congrats on the lost tooth, Mason! It is bittersweet isn't it?! And man, does he have some seriously GORGEOUS eyes! We're a plain ol' poopy-brown=eyed family here. All of us. First I have to say - OH NO!!! I'm not ready for loose teeth and grown up kids! Mason and Aleena are only a week or two apart! Secondly, too funny you've blogged about this!!! Check out DownSyn - I JUST posted about Aleena growing up in front of my eyes and posted NOW and THEN pictures. I ALSO have pics from a couple of the get togethers, looking at many of our little ones when they were actually LITTLE! LOL Including your kids! I feel ya. Hunter just turned 5 last week and I was seriously depressed about it. We tried for a couple of years to get prego with him too, WHY does it have to go so fast?? How exciting! But yes, the time does go by too quickly. I find that the older I get, the faster it goes by. What happened to the weeks of torture when we were kids in school, just waiting until summer vacation? That's when time went very slowly. Samantha's nearly 3, and I'm terrified of her growing up too fast. I love this age. Mason is a very handsome boy!